Serves: 8 people Difficulty ': Easy Preparation time: 1 hour + 1 hour rest INGREDIENTS 300g butter oil. pulp choice of chopped beef 250gr. pork loin, salt, pepper, chopped 150g light red wine. Parma ham Parmesan cheese 8 eggs 2 large truffles 700gr. flour PROCEEDINGS -------------------------- First prepare the stuffing for ravioli: Place a pan on the stove with a large knob of butter and 3 tablespoons of oil do heat well, then add the two amounts 'of minced meat and let them brown well over moderate heat, pour a glass of light red wine, salt, pepper, and as soon as the wine has' evaporated, add a ladle of water and let dry in the cooking over medium heat. 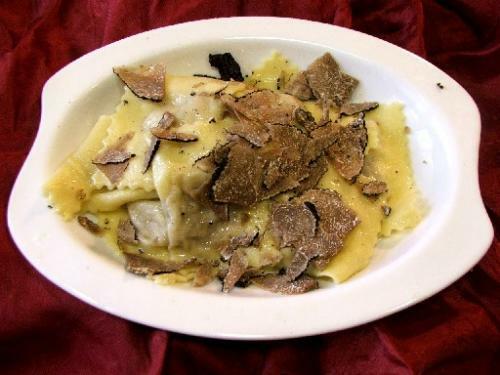 Remove the meat from the heat and add well-chopped ham, 2 eggs, two big handfuls of grated Parmesan and chopped truffle. Mix well and let the mixture stand. Prepare the dough: Place the flour on a pastry, stir in six eggs, a large pinch of salt and water just enough to get a consistent paste and stretchy tirerete into sheets thin enough. 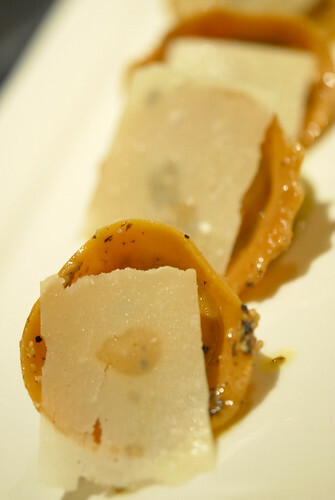 On each sheet have the mounds of filling at regular intervals and form of ravioli and cut with the appropriate wheel, pressing the outer edges of the dough, so that they remain members. Let stand for 1 hour, so that the pasta dry a little. Boil them in plenty of boiling water, arrange them in a bowl, drizzle with plenty of melted butter, grated Parmesan cheese and sprinkle with the remaining truffles cut into strips.